LOST MY PARTNER blog: a reminder that'll give you a boost! a reminder that'll give you a boost! 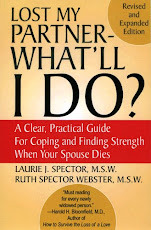 While you’re in the midst of grieving for your spouse/partner, it’s easy to feel overwhelmed and at times defeated by the burdens of new tasks and responsibilities. Caught up in the day to day struggles of surviving your loss, it may feel discouraging to think about how much still lies ahead of you. It’s important however, to pause and notice how far you’ve already come since the death. Try to remember how you were functioning a week, a month, or months ago. Picture yourself as you were back then. - Now consider all the little steps you’ve achieved since those earlier times. - What challenges have you faced and managed to deal with? - What strengths have you discovered within yourself that you never realized before? Now give yourself a well-deserved pat on the back. You might also consider recording your progress in a journal. It’s a good way to keep track of how far you’ve come.